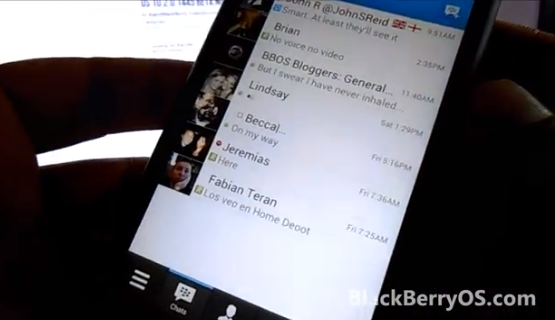 BlackBerry Messenger (BBM) for Android Video - Watch it Now !!! Not quite long ago, We released a post about BlackBerry Messenger for Android and iOS Beta Version and we mentioned in the post that the BBM for Android is now in its testing mode where some Android users were invited via email to help BlackBerry test the IM Application if its working properly and if its ready to go live on Android SmartPhones. While we are yet to see the final version release of BlackBerry Messenger for Android & iOS, one of the Beta tester managed to record the look of the BlackBerry Messenger on an Android Smartphone - HTC First. Embedded in this post (below) is the video for your viewing pleasure. Watch it Now !!! before BlackBerry orders us to remove it. What do you think about the display, navigation and properties of this Messenger we've all been waiting for ? I hope some BlackBerry Z10 and BlackBerry Q10 users are not getting jealous because of its design. Lets Hear from you, Kindly use the comment box below and make sure you share this important update with your friends. BBM, Please come Fast !! !